Hi, friends...Welcome to AYESHA'S KITCHEN. No need of a special introduction to Karahi Gosht / Mutton kadai. 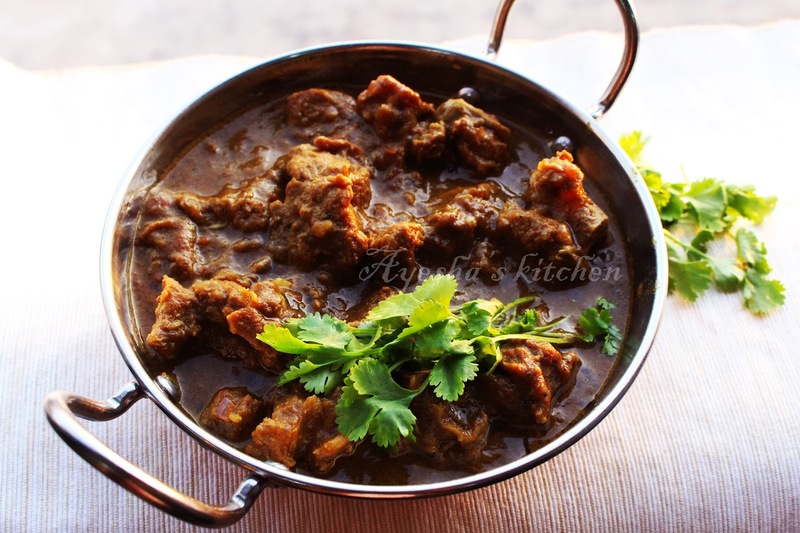 Mutton karahi is a dish with mutton, which is traditionally made in cast iron wok called kadai / karai / kadhai / cheena chatti. Karahi is a popular meal in Pakistan cuisine which is consumed with nan. 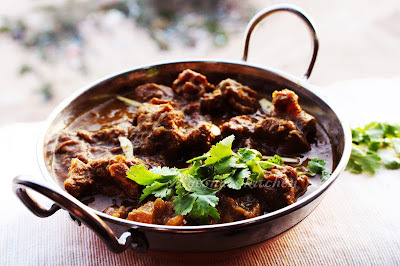 And In Indian cuisine, this dish is Mutton kadai. So let us see how to cook kadayi mutton / yummy lamb recipe at home. Dry roast all these ingredients except turmeric powder and grind them to a fine powder in the smallest jar of the grinder. Marinate the cleaned mutton with turmeric powder, coriander powder, and salt. Add half a cup of water to it and pressure cook it for 2 whistles. When done set aside the mutton and the stock separately. Heat a wok ( kadai / karahi) with 1 tbsp of oil. Add tomato puree and 1 tbsp of karahi masala powder to it. Cook for few minutes and then add the stock water to it. Cook well till it becomes thick gravy or until the oil separates. Then transfer it to a bowl. Now again heat the same wok with 2 tbsp of oil and saute onions till golden. Then add chopped tomato and cook until it becomes tender. When done, add ginger garlic paste, green chilies. 1 tbsp of karahi masala powder, pepper powder, and salt. Cook well for 3 minutes. Now add the cooked mutton to it along with the tomato pureed stock gravy. Then give a fine stir and cook for another 15 minutes in a low flame or until the oil separates and floats on the top. Serve hot with tandoori roti and nan bread. NOTE ..I DID'T USED CHILLY POWDER, INSTEAD USED PEPPER POWDER AND DRIED RED CHILI ONLY. FOR HOT FLAVOR, YOU CAN USE 1 TBSP OF CHILI POWDER .